Today we take a look at one of our favorite type of HoF candidates. The convicted PED user. Rafaiel Palmeiro put up career Hall of Fame numbers for any era, including the steroid era. The simple answer is 500 HR, 3000 Hits = HOF - The complicating factor is that on August 1 2005 Rafael Palmeiro incurred a 10 game suspension from MLB for failing a drug test. Had Palmeiro's career ended on July 15th 2005, he would likely be in the Hall of Fame today. On that day he singled of Joel Piniro giving him 3000 hits along with 566 Home Runs. Unfortunately for Palmeiro, his career went on for another couple of weeks. One of the odder things I remember about the whole Rafael Palmeiro saga is this interview of Bob Costas that took place on the Jon Stewart show. For the short attention span folks skip to the 2:20 mark. Costas is just playing this for laughs because he is on Comedy Central, but he does mention that Palmeiro is a good guy, he mentions his records, he mentions the senate hearings - "denied steroid use emphatically, and I accept that" (wow) , and then he mentions Viagra as the ultimate Performance Enhancing Drug. This interview took place on July 27, 2005 - Just Five Days prior to the Palmeiro suspension. Looking inside Palmeiro's largely accumultor type numbers he comes out right near the Average HoF firstbaseman. He was more than just a bat only firstbaseman, he earned a couple of Gold Gloves. Like Craig Biggio who we examined last week, he has no World Championships, but he was on a couple of playoff squads. Phungo Verdict: HOF - This may be a bit of a surpise Yes Vote, but a little background. A few months ago I saw author/cultural critic Chuck Klosterman speak in Philadelphia. He mentioned that he believed that all criticism (film/music/politics whatever) was "Autobiography". And I agree - So this vote for Rafael Palmeiro is all about me. On July 30 2005 I attended a game between the O's and White Sox. In the 6th inning I was stanging in a busy area of the Right Field portch at Camden Yards. 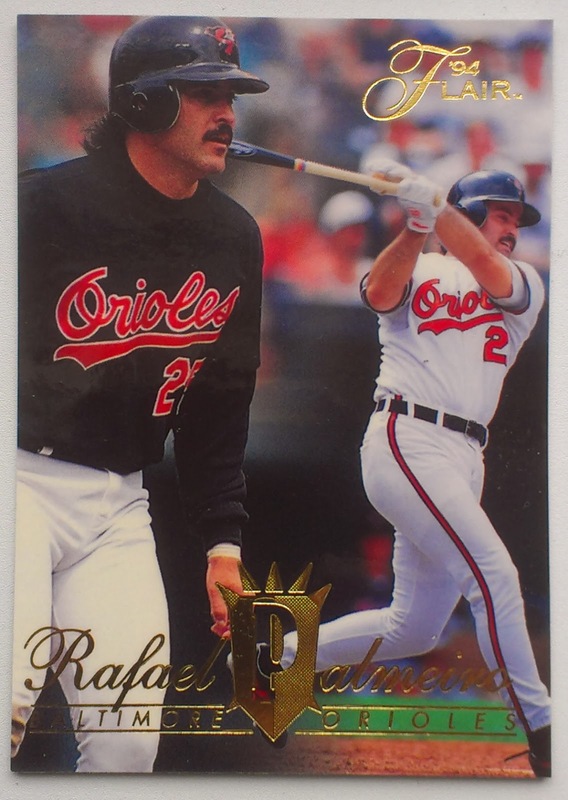 That is when Rafael Palmeiro hit is 569th career Homer. It landed may 30 feet from me. Two days later Palmeiro was suspended, a month later he was out of baseball. It was the last Home Run Palmeiro would ever hit. So yes I am voting for Rafael Palmeiro, just so I can say that I was at the game where he hit his final Home Run. After all it IS all about me. This afternoon the Minnesota Vikings host the Detroit Lions in their final game at the Metrodome. I know this sounds a little funky, but my football squad is the Minnesota Vikings. Today they close the building that served as their home for the past 3+ decades. 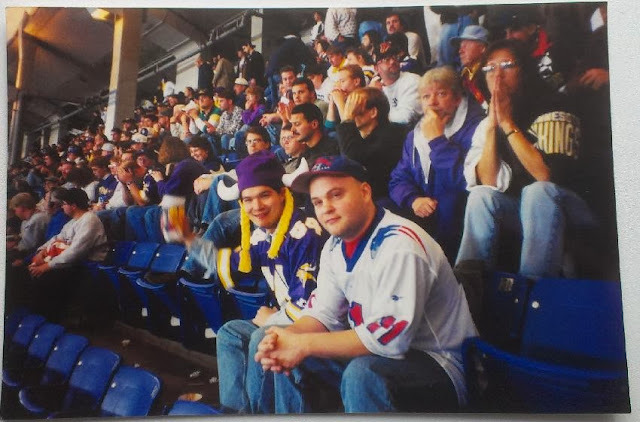 Twice in the late 1990s I was fortunate enough to make the pilgramage out to Minneapolis to see the Vikings play - Yep that is a younger thinner version of me in the braids - My friend Sluggo (everybody has a friend that goes by Sluggo right) is wearing the Pats jersey. The Vikings beat the Patriots that day 23-18, Cris Carter had a 4th quarter TD for the good guys, The Vikings QB was Brad Johnson. Back then New England was pre-Tom Brady and we got to see Drew Bledsoe at the helm. A few years ago we put together one of my favorite postings regarding the Twins last game at the Metrodome - check it out here. The day after Christmas started with news of Mike Hegan's death and then ended with word that Paul Blair had passed. I like when subset honor former players that aren't big time Hall of Famers. Paul Blair certainly falls into this category. He was known as a superb defender and won eight Gold Gloves. Appropriately advanced metrics back up Blair's defensive reputation. He led the league in various defensive categories including Putouts, Asssists, Zone Runs, Range Factor, and Fielding Percentage multiple times. It also should be noted that good teams followed Blair around he was part of 6 World Series squads and four championship team (2 Each for the Baltimore Orioles and New York Yankees). Today I awoke to the sad news that Mike Hegan died. This is one of two cards of Mike Hegan as a Pilot. 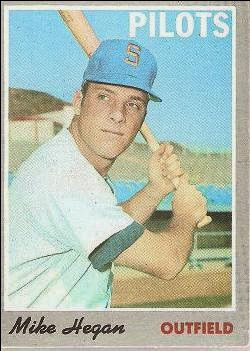 He is also listed with Seattle on a capless 1969T card. This is also the only one of Mike Hegan's ten solo Topps cards where he is listed strictly as an outfielder. On his remaining base cards he is listed as a first baseman or 1B-OF. When this card was issued in 1970 Hegan was coming off of his only All-Star season. He batted .292 with a .427 OBP. Had Hegan had enough AB to qualify he would have finished 2nd to Harmon Killebrew by only fractions of a point for the OBP lead. In 1972 Hegan collected a World Series ring as a member of the Oakland A's. Mike Hegan was a second generation player, His father Jim Hegan played for the Cleveland Indians during the 1940s and 50s making several all-star teams. The senior Hegan spent part of the 1959 season with the Phillies. Always love dragging out this favorite photo from the Phungo Collection. Thanks for dropping in with team Phungo this past year, Enjoy the holidays and best wishes for a fun and happy 2014! 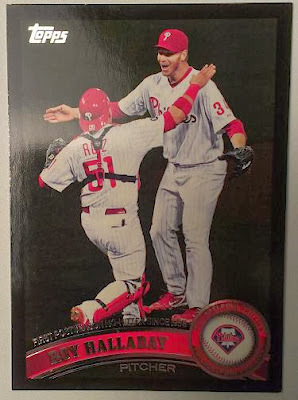 My first thought when I saw the a Phillies player on an Emarald Parallel was Christmas. 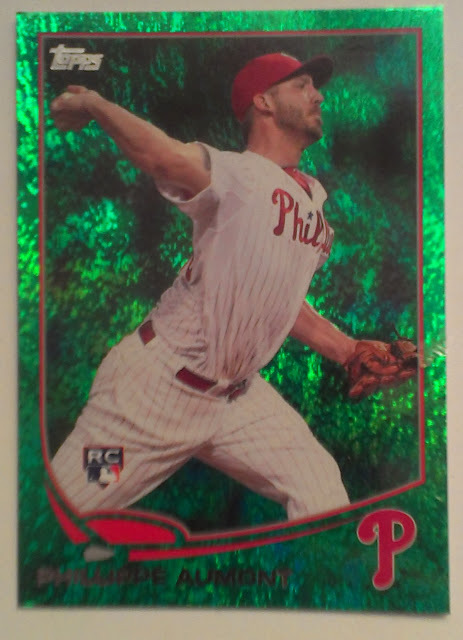 In fact for 2013 Topps Green parallels, I pretty much think that for any player who's team color is red. See What I mean. Not only are they green, but the chormium pattern/texture evokes a hybrid of tinsel and pine needles. Phillippe Aumont has been an enigma for the Phillies since he was acquired from the Mariners in the second Cliff Lee deal. Aumont was drafted by Seattle with the 11th overall pick of the 2007 draft. The hard throwing lefty has put up a respectable 1K per inning strikeout ratio at all levels including the majors. And his Hits/Inning ratio is equally good at about 1.0 H/IP. The trouble is his insanely high walk numbers - 13 BBs in under 20 IPs for the Phillies in 2013. He was sent back to Lehigh Valley where his walk numbers were even worse. Statistically Aumont's problem appears to be more than just wildness. He simply will not trust his stuff. 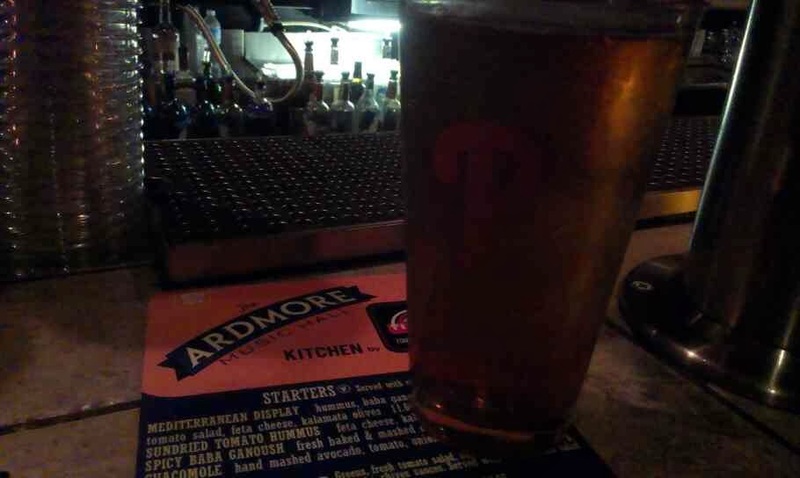 Aumont is yet to give up a Home Run in 34 major league innings. As a professional he has never yielded a HR/9 of more than 0.7 in any of his six seasons. His H/9 numbers have never been above 10 for a full seaosn. He is clearly trying to hard to avoid contact. Phillipe Aumont will be only 24 years old when the 2014 campaign commences and remains protected on the Phillies 40-man roster. The Phillies erratic bullpen could certainly use Aumont's power arm if he can sort out those high walk numbers. Tonight the San Francisco 49ers host the Atlanta Falcons in an NFL game that could be the last professional sports contest at Candlestick Park. The Stick was also home for the San Francisco Giants for 40 seasons. Two years after the Giants abandoned New York for the Bay they moved into Candlestick where they remained for 40 years through the 1999 campaign. Tonight to honor the last game at Candlestick we post a card from 1992 Topps, which placed a small picture of the players home park across the bottom of each cards b-side. The pix are small and it is pretty hard to distinguish one stadium from another, but it was an interesting idea. I figure since it's his card we will knock out a couple of quick words on the player on the card front. 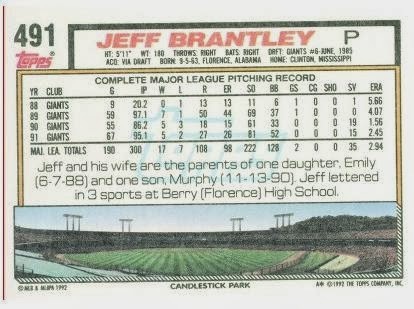 Jeff Brantley spent a couple of years at the end of his career with the Phillies including a 23 save season in 2000. All told Brantley spent 14 years in the majors, The first half of which he spent with the Giants. Career highlights include postseasons appearances in 1989 with the Giants and 1995 with the Reds. 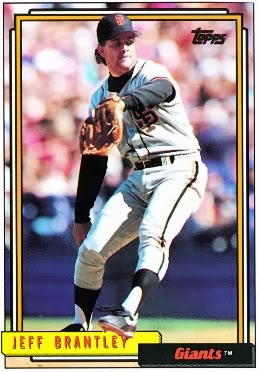 He represented the Giants at the all-star game in 1990 and with the Reds in 1996 he led the NL with 44 saves. .
Candlestick Park hosted No-Hitters on consecutive days in 1968. On September 17th, Hall of Famers Gaylord Perry and Bob Gibson squared off with Perry getting the 1-0 victory for the Giants. The following day the Cardinals returned the favor behind Ray Washburn who blanked the Giants 2-0. Earlier this year Craig Biggio had a pretty solid HoF Ballot debut. He picked up 68% of the 569 votes cast in the 2013 election. This left him 39 votes shy of the 427 necessary for Hall induction. There are 28 MLB players who have 3000 or more career hits. 25 of those 28 are in the Hall of Fame, the other 3 are Derek Jeter (active), Pete Rose (ineligible) and Rafael Palmiero (in limbo). Craig Biggio is on the low end of the club at 3060, but is good enough to rank him 21st all time. Six of the 7 members of the 3000 hit club that are below Biggio were first ballot Hall of Famers - The exception is Palmiero. He ranks very high in a number of offensive categories 1844 Runs (15th), 4711 TBs (33rd), 668th doubles (5th, 1st among second basemen). The seven time all-star also earned kudos in the field with four gold glove awards at second base. Biggio's WAR/WAR7/JAWS numbers are all just below the HoF averages for second baseman. Part of this may be due to his many ABs at other positions. I don't think we should hold Biggio's versatility against him here - his other positions were basically Catcher and Centerfield - not like he was slacking over at first or DH. I am a fan of cards showing players outside of their typical position. 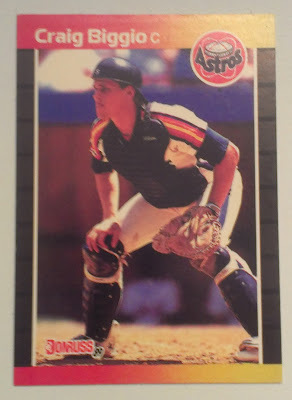 The early Craig Biggio cards may be the King of the off-Postion cards. Unless you have done the pitcher/position player jump the best you can do is catcher. And here we have early cards of a potential HoF playing catcher - Love it. The first of Craig Biggio's 3060 career hits came off of Orel Hershiser in a game where he was catching future Hall of Famer Nolan Ryan. Phungo Verdict: HOF - 3000 hit clubs, several other very good accumulator numbers at a middle infield position and respectable advanced metrics. Honestly, I am not sure how Biggio didn't get in a year ago. 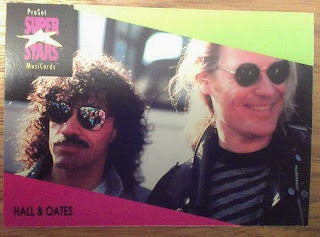 Tuesday 2013-12-17 the Rock n Roll HoF announced Phillies Pop Soul Duo Hall & Oates induction. Weds 2013-12-18 Former Phil Raul Ibanez signs w/ Angels, Phillies DFA former prospect Sebastian Valle. The return of Lou Marson to the Phillies via spring training invite also announced on Wednesday. and Finally Phillies Hall of Famer Steve Carlton turns 70 today. Happy Birthday Lefty! 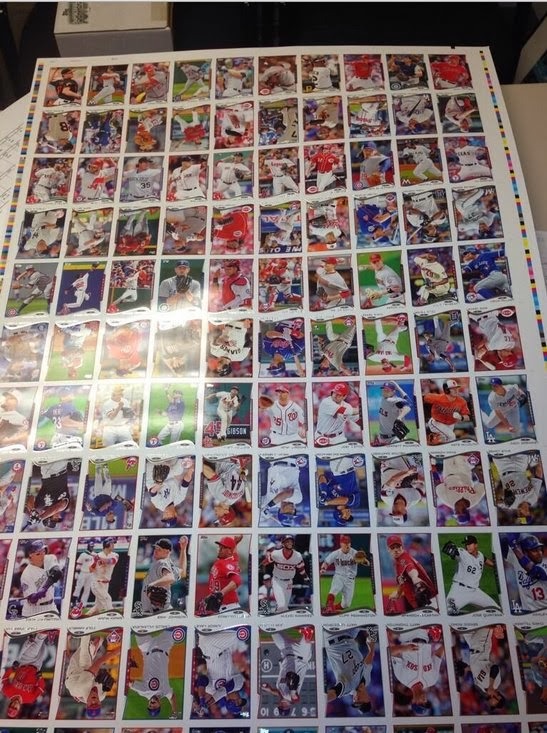 This morning Wrigley Wax posted this pic from the @ToppsCards Twitter account - it is a sheet of 2014 Topps! I dont have the patience of Wrigley Wax, the crack team over there went through the entire sheet and identified 3 of the 4 Cubs, a commenter then was able to pick up the final player. I took a quick glance for Phillies players and the only one I picked out is near the bottom left, I believe we have Mr Cole Hamels (standing on his head). Perhaps Ryan Howard Right Hand Side 3 Rows from the bottom also upside down. There is a 3rd Phillies player row 6 just to the right of center (RHP)- once again upside down. A few days ago the Phillies announce a few of their Non-Roster Spring Training Invitees. The names of the traditionally AAAA players included two familiar names. One was Hall of Fame offspring Tony Gwynn Jr, The other was our old friend Lou Marson. Marson got into a handful of games with the Phillies before being traded away in the first Cliff Lee deal. Since then he has several unimpressive seasons with the Indians without eclipsing 300 plate appearances in any single campaign. 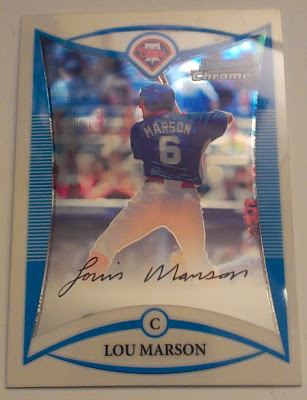 As mentioned above Lou Marson now finds himself on the fulcrum between AAA and the Majors sometimes referred to as AAAA, 4A or Quad-A. He has established he can play in the Majors if he is really needed, but he really doesn't have the skillset to hit/stay at that level. The Phillies have brought in Marson as depth behind Carlos Ruiz and the recently acquired Wil Nieves. Essentially Marson is here to replace the recently departed Steven Lerud. 2008 Bowman Draft contains 45 Futures Game prospect cards that run from #BDPP66 thru #BDP110. The Philies are represented by Marson, Carlos Carrasco(#BDPP66), Jason Donald(85), and Greg Golson(77). Other set notables include Andrew McCutchen (69), Dexter Fowler (76), Pablo Sandoval (84), and Elvis Andrus (89). Future Games Prospects have been a part of Bowman Draft since the collections inception in 2002. BDPP has contains Futures Game base or subset cards in most recent series. However that is not the case in 2013. I am bummed that this year the Futures Game is not represented with base cards - fortunately for Future Games enthusiasts there are FG Relics in the set. Team Phungo has been lucky enough to attend a couple of Futures Games. I registered some random thoughts on the 2008 edition hosted by the Yankees here. The December version of the PhillyShow was a bit of a mess for a variety of reasons. 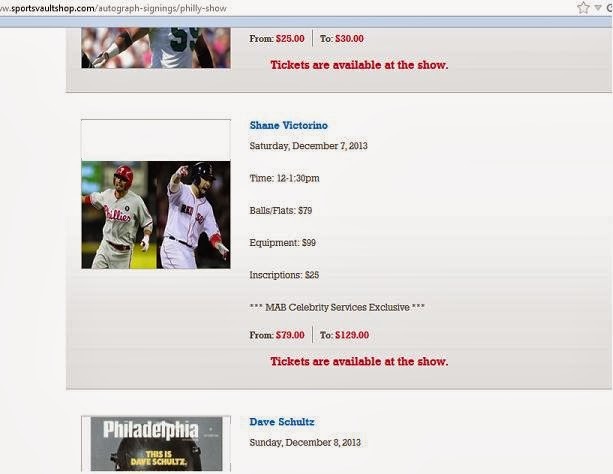 Shane Victorino was unable to make the show and the promoter failed to update their website. The Ruben Amaro card above is one of two 1963F Phillies cards that I picked up. 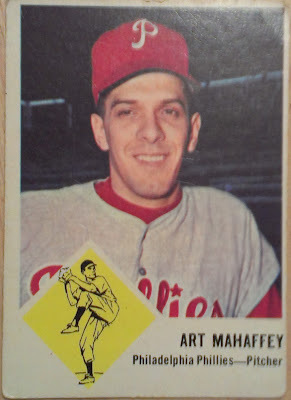 The other was #54 Art Mahaffey. 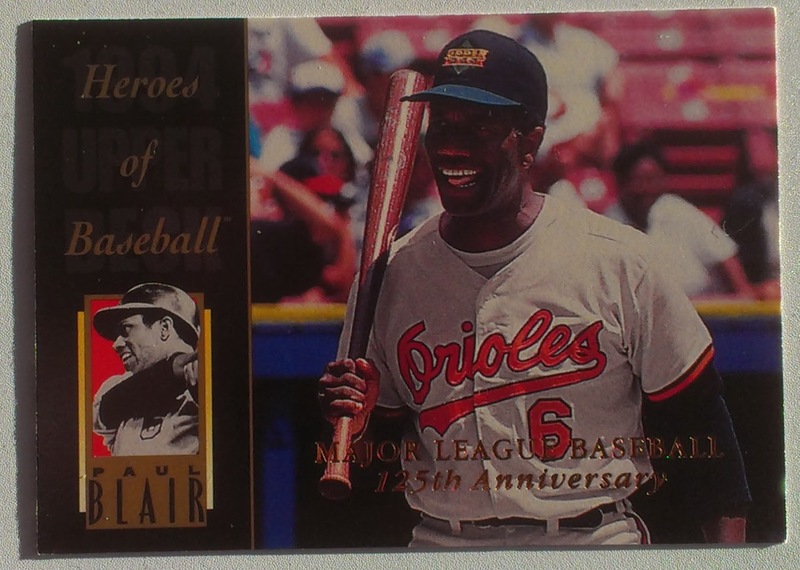 1963 Fleer is a set that I am fond of and at various times have consider building. 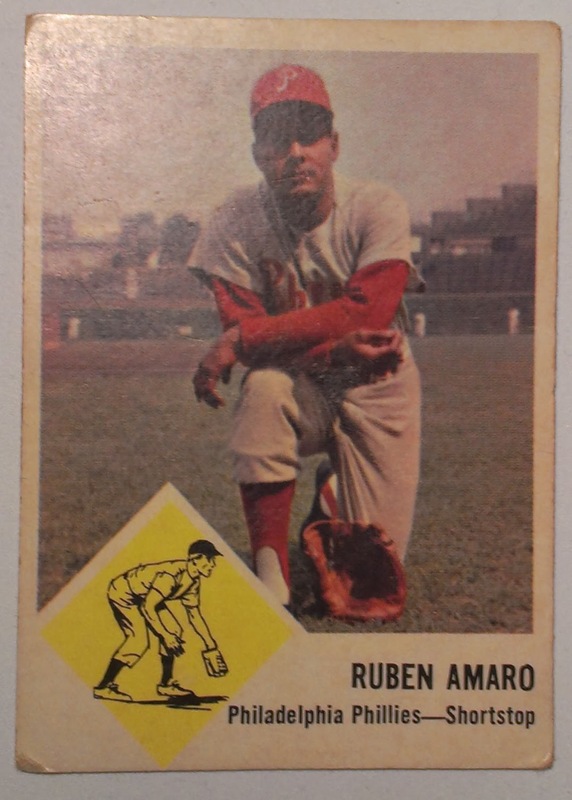 The abbreviated set is a mere 66 cards - Due to a legal action from Topps, Fleer was only able to produce a single series. The series is significant for containing the first Maury Wills card. There are five Philies in the set. 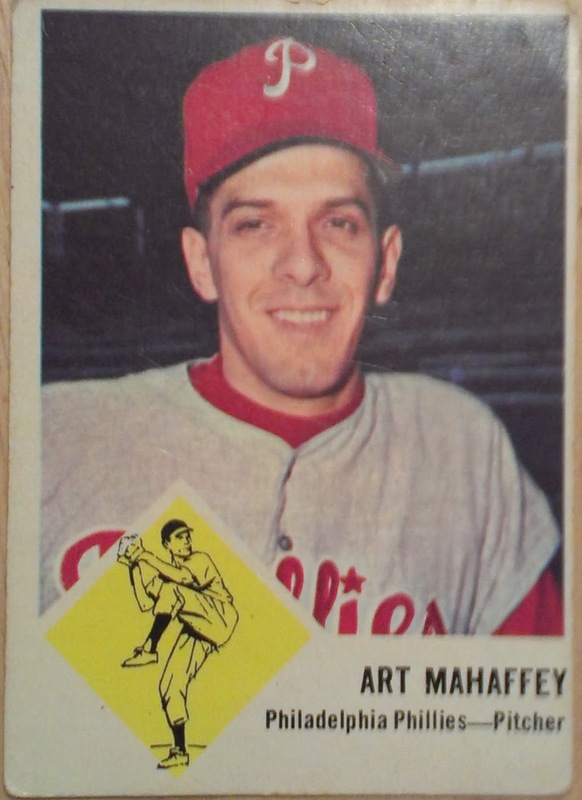 The Amaro and Mahaffey cards seen here are the bookends for the 63F Phillies team set which runs from #50-54. 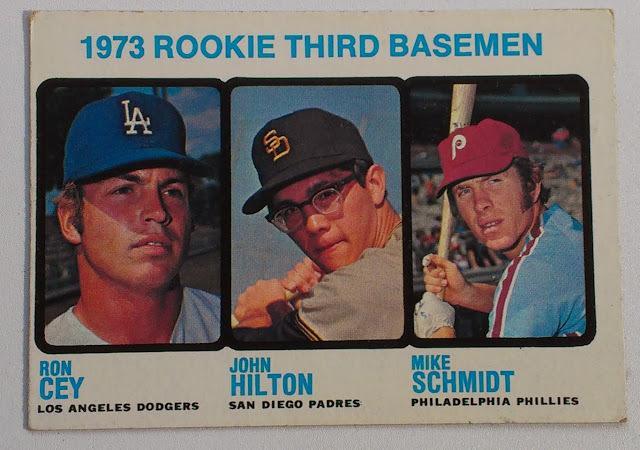 The three middle cards are Johnny Callison, Clay Dalrymple and Don Demeter. If you want an easy to build Vintage Phillies team set, this may be the one for you - each of the above cards went for $2. Tonight in our HoF ballot series we take a look at my favorite borderline candidate. There are flaws in his resume, but for me Mike Mussina is a strong Hall of Fame candidate. Notable career numbers include his 270 wins vs 153 Ls (117 above .500) and 2813 career Ks (19th all time). The Vote No on Mussina argument falls into 3 areas 1) No dominant season (no Cy Young Award), 2) His stats are largely Accumulators, 3) No Championships - an omission that is further exacerbated by the fact that he spent 8 seasons with the Yankees who bookended Mussina's tenure w/ World Series Wins on each end. -He may have never won a Cy Young Award, but he did lead the league in Pitching WAR in 2001. -Mussina's Black Ink scores are very soft but his Gray Ink Test is quite strong. While not pointing to a dominant season, this does tell us that Mussina was in the top 10 of pitching categories often. I think the accumulators argument falls flat largely based off of the gray ink. -Finally in 2001 had the "Greatest Closer Ever" not blown a save, Mussina would have a World Series Ring. Inside the Numbers is a 21 card subset in 1993 UD (#450 - #470) with each card featuring a short writeup by HoF baseball journalist Peter Gammons. 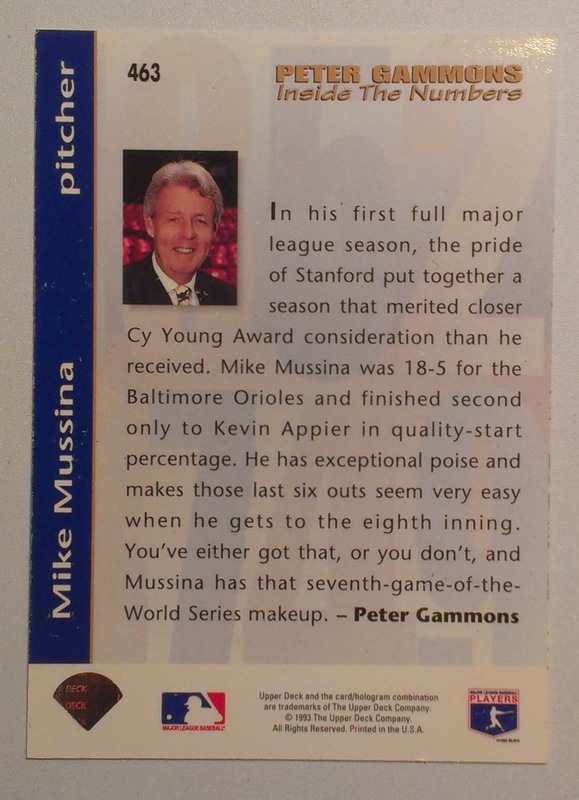 Clear back in 1993 Gammons referred to Mussina as having Game Seven Make-up. The Phillies are represented by Dave Hollins, other players getting the Gammons treatment include Chipper Jones, Jeff Bagwell, Dave Justice, Bernie Williams, and Pudge Rodriguez. 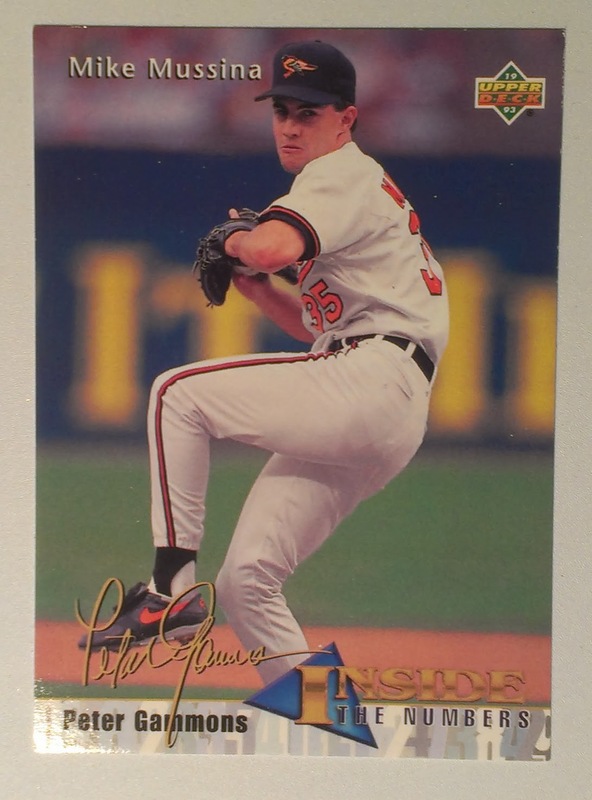 Phungo Verdict: HoF - Full Disclosure, I met Mike Mussina in 2001. An acquaintance of mine is related to Mussina's wife. We didn't talk much but he was a real decent and polite guy. I am glad I met him and I was really happy to find out that he was good guy. So yes this may influence my opinion a bit, but I am happy to say that I think the numbers look HoF worthy on there own. Blackberry Jam - Hominy Grill, Crepes at the Charleston Farmer Market in Marion Square. 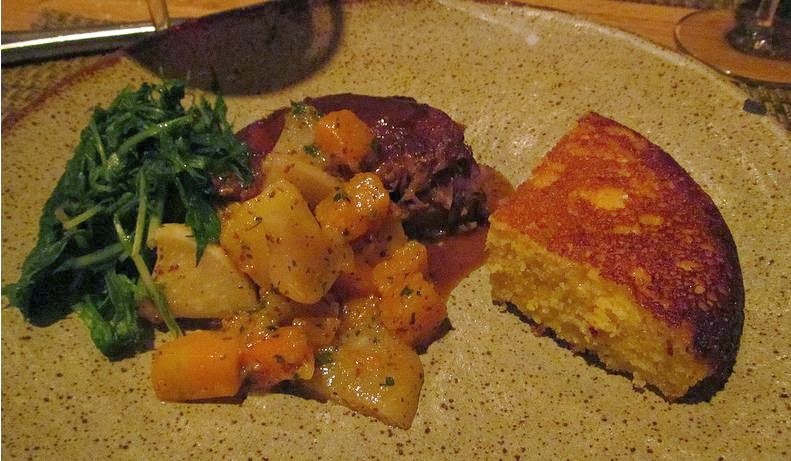 Charleston is a great town for Foodies, Beer Geeks, and Vacationing. There is a great blend of of city and town, beaches and history. Several nearby colleges keep the area fresh and provide some cheaper options then other destination sites. Overall this was my favorite place we dined. The food was forward, fresh and interesting, Service was great and the room was fun. Historic, Local, interesting. Definitely make time to go to the next door Husk Bar pregame (or postgmame or BOTH!). Cool small dining room/bar celebrates everything Local and DIY. Some interesting meets a cheeses. A few blocks outside the Charleston City center. Rumor is the owners are somehow Philadelphia connected. Sorry about the blurriness. This pix totally amuses me - I think of Lou as some dude who was just to cool to leave NYC. And if he went anywhere I just couldn't see him in a southern restaurant which is specifically known for their grits. 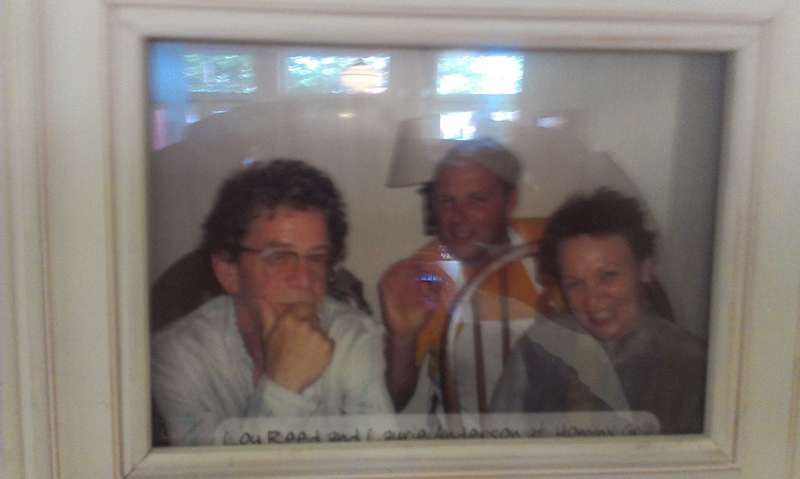 Laurie's smile seems just so honest and is an interesting counterpoint to Lou's notoriously prickly personality. Lots of options from food carts give you some great options for dining at a table or bench in Marion Square. I think this Old School Charleston, cleverly acronymed SNOB, but they do feature a maverick table - nice option for solo diners and walk-ins. There are five beaches near Charleston, we chose to check out Folly Beach which features a 1000 foot fishing pier. I was a bit skeptical about the $20 pricetag for admission, but it ended up being worth it for team Phungo. we took two tours on the grounds. Boone has a jumbled history that ended up crisscrossing into several of our interests. Chickflick the Notebook was filmed here as was the Halle Berry miniseries Queen. Thoroughbred Princequillo was trained there - Secretariat was one of the many successful descendants of Princequilo. 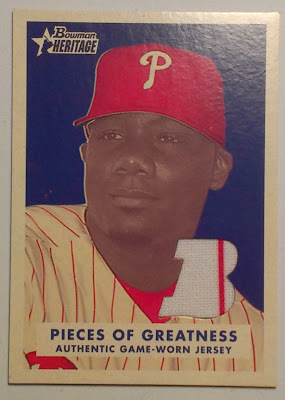 In today's edition of 1983 Wheeze Kids we present a Big Fish in any Phillies Fans Collection. The 1983 Phillies didn't have many standout hitting seasons on their roster. The exception was Mike Schmidt, He led the league in Home Runs, Walks and OBP . It was good enough for 3rd in the MVP voting behind Dale Murphy and Andre Dawson. Schmidt's regular season carried into the NLCS which saw him bat .467 with a pair of doubles and a Home Run, for a nice .800 slugging number. Unfortunatley for the Phillies The Orioles pitching staff figured out the future Hall of Famer and Schmidt stuggled during the World Series only managing a single in 20 ABs. 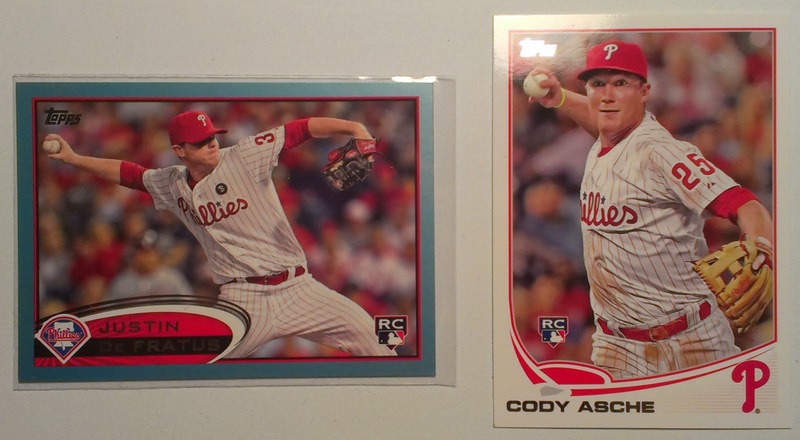 I picked up the above card a little over a year ago for just under $42 via ebay. At some point I will do a full FTC on the auction numbers for this card, but don't have my stuff together today. Night Owl Cards - A view of this card from a Dodger Fan. Today Roy Halladay announced his retirement, it is a really sad event for this Phillies fan. We were really fortunate to get to see two great seasons out of Halladay, before baseball, pitching, and age all took their toll on the once dominant right hander. I have been to 200+ ballgames and the game featured on the above card is the best of them. For the final three, four or maybe even five innings the crowd hung on Doc's every pitch - it was an absolutely amazing night, the Reds never had a chance. Since it took all of two days to get through all of the former Phillies on the ballot, team Phungo is going to take a look at some of the other candidates. Today's feature is Larry Walker. This isn't the Larry Walker Topps RC (It is preceded by 1990 Topps #757 plus a number of other cards by Score, Donruss, Fleer and others ) but not of those cards have the fine Topps All-Star Rookie Trophy. 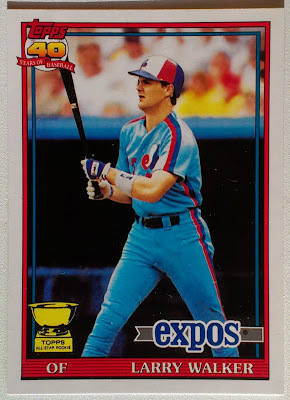 Larry Walker is generally remembered for his decade with the Rockies, but he did come up with the Montreal Expos with whom he spent six seasons. Walker is a career .313 HR with 383 Home Runs. Those numbers may have gotten a guy in the HoF a few generations ago, but that hasn't yet happened for Walker who is now on his 4th ballot. Without checking I would not put Larry Walker in the HoF. Digging around in Baseball-Ref I found the following. Walker won the 1997 MVP award which he deserved according to WAR ratings. He had 2 Batting Titles (Coor assisted). His other LL included OBP, slugging, and OPS each twice and Homers once. His Awards mantle includes 7 Gold Gloves and a trio of Silver Sluggers. The five time all-star was a part of 3 playoff teams including the 2004 Cardinals who took the NL Pennant before losing to the Curse-Breaking Red Sox team. This is the WAR numbers where I am taking it on faith that all these folks are doing their calculations correctly. -WAR RF (72.6): The average WAR for HOF RF is 73.3, but this is at a position that includes Babe Ruth. Every WAR RF above Walker is in the HoF. Walker ranks above at least a dozen RFs already in the Hall plus Joe Jackson. -WAR7(44.6): this tracks a players 7 best WAR seasons. The RF HoF average is 42.9. Once again every RF above Walker is HoF and Walker ranks above 12+ HoF. -JAWS RF (58.6): JAWS(developed by Jay Jaffe) accounts for a players 7 year Peak along with their career WAR. Among Right Fielders Larry Walker ranks 10th in JAWS. and as with the previous WAR related categories Walker ranks above at least a dozen RFs already in the Hall plus Joe Jackson. Phungo Verdict: HOF - This is a pleasant surprise, Walker ranks right at the average player for his WAR. His number may be Coors inflated, but from what understand WAR should account for this issue. Beyond WAR he has decent Sim scores and has always been represented as a good dude. The one drawback on his resume beyond the Mile High Home games is his lack of playoff experience and no World Championship. Marty had a tough 1983 season as a bottom starter in the Phillies rotation. So poor that Bystrom didn't get a start in the postseason. His sole inning was versus the Orioles in the final game of the World Series. 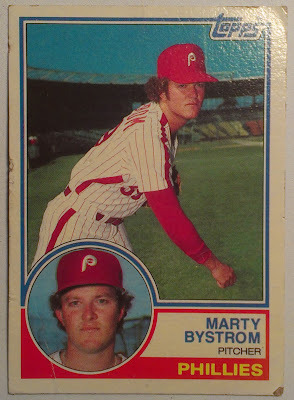 In 1983 the 24 year old Marty Bystrom was already on his way out of baseball. His 119+ innings in '83 were the most he would pitch in a season, by June of 1984 he was on his way to the Yankees in a deal that would return Shane Rawley. Bystrom got 15 more starts with the Yankees over two seasons then was done at the Major league level. I doubt Marty would have made the cut for our Wheeze Kids series, but he is one of several Phillies in town to sign autographs at the Philly Show in Valley Forge this weekend. The show runs Friday 12/6 - Sunday 12/8 at the Valley Forge Casino. Admission is $8 - There may be a $1 off coupon in local papers. It is not uncommon for The PhillyShow to have autograph cancellations and not keep their website updated. This past Wednesday Erin McKeown brought her Anti-Christmas Spectacular to the recently rebranded/refurbished Ardmore Music Hall. The night was a great fun and I look forward to the show returning in the future. Erin McKeown is blessed with tremendous talent, on stage you can tell she is a seasoned professional, deft musician, and terrific vocalist. Add to this her keen wit and skilled songwriting and you have the makings of a very entertaining show. The Anti-Holiday Spectacular is a 2 set show. The first is an abbreviated concert. While I am not that familiar with her catalog, she was able to mix in some songs that I sort of knew (likely from Grand – including The excellent “Taste of You” and a reworked “Vera”). She also delved deeper into her catalog for the more devoted fan. The set was solo with McKeown spending the bulk of the time on the guitar with 2 or 3 songs done behind the keys. Adept at many styles she picked a good varety of songs pop, rockabilly, and jazz. As well done as the traditional set was, The Anti-Christmas set was the highlight of the evening. Basically McKeown claimed to have written a Christmas Musical which her theater contacts deemed unproduceable - apparently “Santa is an Assh-le” isn’t the type of song that can be done in a musical. Fortunately as McKeown stated “You can put anything on a record” and this is how the Anti-Christmas show came to be. Songs feature rewritten classics and some new songs that echo the Christmas sound. 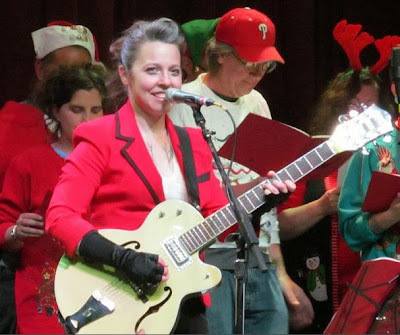 She had enough to put together an entire set with a makeshift chorus that I believe featured local members of the Philadelphia Folksong society – All donning ugly sweaters. For both of my followers I want to mention that McKeown has a Sports Column she writes for the WNYC radio Soundcheck blog. 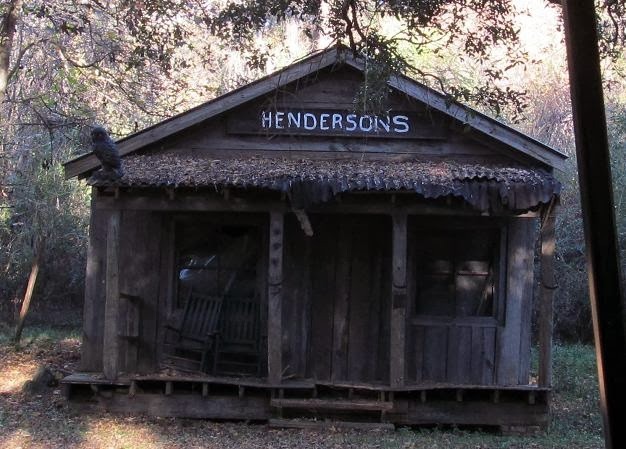 During the show, McKeown played a song that mentions Hall of Famer (HoF Jerk) Rickey Henderson. 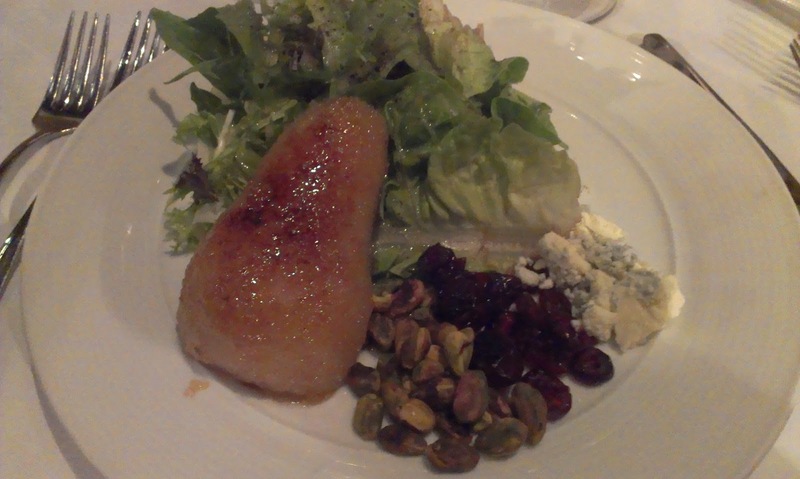 – I didn’t eat there but they had a mediteranean menu that appeared appropriate to the style of the room. The picture of Ryan Howard is a little odd as Topps is trying to capture the style of the classic 1949 Bowman here. Cool card with a nice striped Jersey snippet. 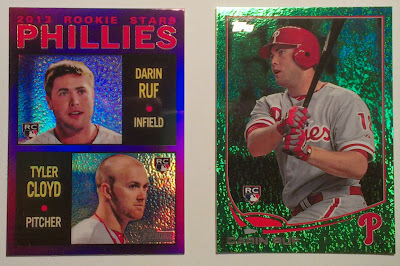 Couple of nice Darin Ruf parallels. Ruf is a bit of a fan favorite but the Phillies latest moves regarding several bench players seem to indicate that Darin isn't in their plans for 2014. Two more Phillies RCs for the collection. Kerry must be busy out there getting new product, the Asche card is part of the Update Series - feels like it just came out. 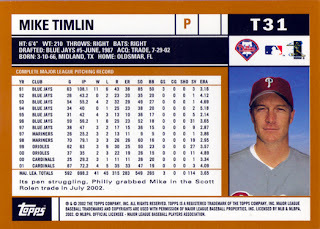 I am not a fan of Mike Timlin. The reliever came to the Phillies in 2002 as part of the Scott Rolen deal. He made it clear that he had not intention of staying with the club following the season. 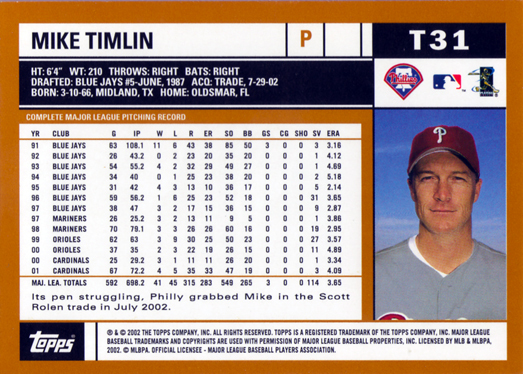 Consequently there are not many Mike Timlin Phillies cards so I had to steal this one from a Capewood posting. Mike Timlin had a 17 year career and has Four World Series Rings. Two with Toronto (including 1993 v the Phillies) and two with the Red Sox. He is in the 1000 game club (141 resulted in saves) and had a career ERA+ of 125. The recently retired Mariano Rivera turns 44 today. To mark the occasion Team Phungo is celebrating by taking a look at one of the Sandman's Short Printed Variations from this years Topps Update set. There are actually 2 variations for this card. 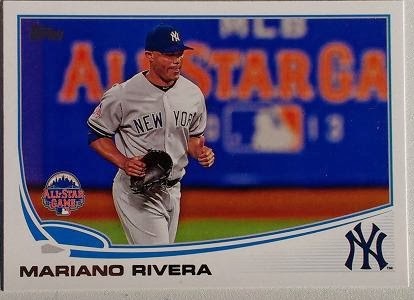 There are so many variations in 2013 Topps that I didn't realize that this card was a SP right away. This is a bit annoying but I am still glad to pick up the minor hit. It is a good looking card with a nice shot of Rivera entering his last all-star game - The partially show All-Star game logo helps highlight the photo. The base version of this variation card has gone as low as $3.52 with 6 auctions concluding under $6. Auctions for this card have ended as high as $19.49. This years Hall of Fame Candidates with Phillies connections is even worse than last year. Curt Schilling returns as does Phoenixville native Mike Piazza who never played with the Phillies but remains noteworthy in the area. The lack of Phillies on this years ballots may partially explain their hopelessness in the 90s and early aughts. 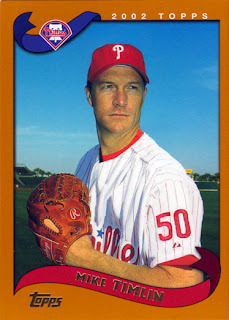 I am not sure if there are any cards out there of Todd Jones in a Phillies Uni. 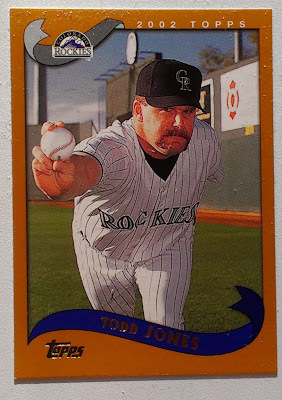 This weeks theme appears to be 2002 Topps as this is a card of Todd Jones in the Phungo Collection. Todd Jones is on the ballot mostly because he qualifies on the 10 year requirement and had a few good years. He is the first to admit he is not a Hall of Famer. The Todd Jones "I am not a Hall of Famer" is pretty refreshing in a baseball coverage world that will nitpick and name-call repeatedly between now thru July 2014 and beyond over this years ballot results. To be honest I enjoy the debates - I don't get to invested in the arguments. There are guys I think are HoF and ones I don't - My opinion is certainly no more valid then the next bloggers and not nearly as valid as anybody in the BBWAA. Todd Jones spent the bottom half of the 2004 season with the Phillies. In '04 Jones was a set up guy and the Phillies had Billy Wagner as the closer. Jones did earn one save for the Phils after Wagner blew a save in Florida. It was one of 319 Saves Jones had in his career which ranks him 16th all time. He once led the league in Saves with 42 for the 2000 Tigers for whom he spent half of his 16 year career. The 42 saves were good enough to get Jones his only All-Star nod and his only Cy Young award votes. Jones was a member of 2 postseason squads including the 2006 Tigers who won the AL Pennant. Jones earned 4 playoff saves for the '06 Tigers. The last save was the only game Detroit won in that World Series. Against the wishes of Team Phungo the Phillies have brought back outfielder Marlon Byrd. I just want the Phillies to get younger they go out and get a 36 year old outfielder. Marlon Byrd is coming off a fine 2013, which may have been the best of his career. He knocked out 24 homers with a very nice .291 BA resulting in a 138 OPS+. If he puts up anywhere near those numbers in 2014 or 15 I will post my apologies to the Phillies Ruben Amaro and Marlon Byrd, but I just can't see it happeing. I may have mentioned this before - I think 2002 Topps is ugly. I suppose it isn't a bad design but boy do I dislike the color, what is that light brown/orange not sure. Beyond the color, I am also not sure why Topps felt it necessary to write their name on the cards twice - once as a logo and once at the top in "2002 Topps". This happened on the base cards not just cards that are included in the prospects subset from which this Marlon Byrd gem was culled. Remember Subsets. 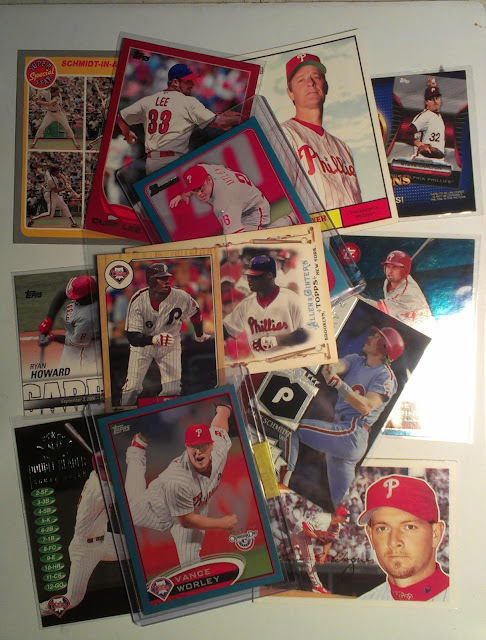 Back before half the pack was Inserts there were subsets. Subsets where all the cards were packed together in one area instead of spread throughout the set like the recent League Leader abominations. In 2002 one of the Subsets was Prospects. 2002 Topps was released in 2 series, the Prospects subset runs from card #307(Jason Lane) thru #326 (Jason Bay RC) in series 1. For Series 2 the Prospect start at #671 (Juan Cruz RC) and finish at #695 (Dan Johnson RC). The Phillies are represented by Byrd in S1 and Taylor Buchholz (#675) and Nate Espy (#680) in S2. Jason Bay (photoed with the Expos) is probably ended up with the best career among the 50 prospects. Other Notables include Hank Blalock (#309), Freddy Sanchez (#313), Boof Bonser (#317), and Rich Harden (#687). 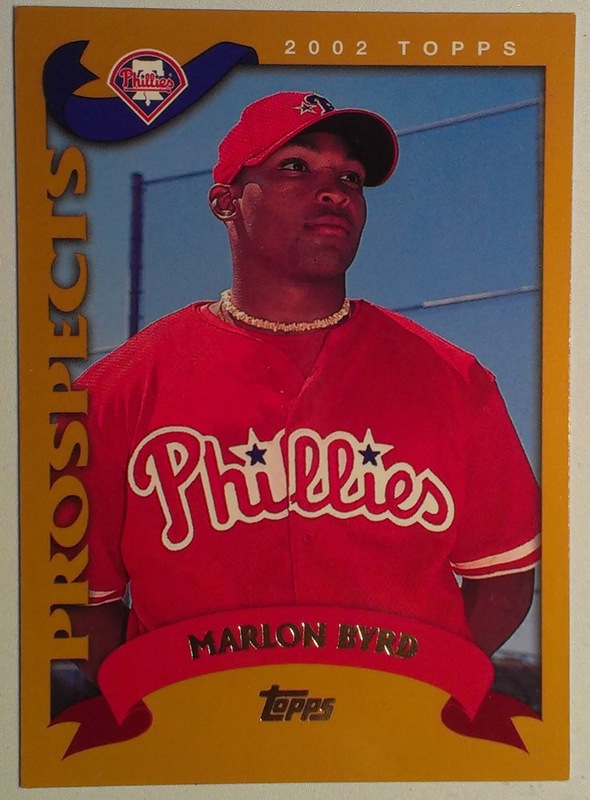 Despite all my complaints regarding Marlon Byrd, I must note that out of the 45 prospects in the 2002 subset, Byrd is the last one standing. Jason Bay announced his retirement in 2013. and beyond that I cannot find anyone else that remains active. On Monday we go the news that Chad Durbin retired. Durbin may have only been a middle reliever for the Phillies, but he performed that job for the 2008 World Champions. That season was among Chad’s best, He had a 2.87 ERA (152 ERA+) in 87+ innings for the Champs. He was a member of three of the Phillies recent postseason teams (2008-2010) prior to moving on to Cleveland and Atlanta then returning to the Phillies for one last stretch this past season. This will always be one of my favorite Phungo Cards and I have featured it a number of times. Partially because I like the card, and partially because there really aren't many Chad Durbin cards. The photo was taken looking down into the Phillies Bullpen following the clinching W in the 2008 World Series. I met Chad Durbin at a card show in 2011 and told him about the picture, he mentioned that he remembered being in the bullpen celebrating. He said it was like being in a movie with all the bright lights shining down and people cheering. By an account I have ever read Durbin is a really decent guy and seems to understand how lucky he has been. He also seems to be prepared for life after baseball. I read via twitter yesterday that he is working with a bat company and if I remember correctly even during his playing days he had an online project that helped connect prospects with scouts. I hope Durbin finds a post playing career with the Phillies or another organization. He's a good guy for the game to have around. Carlos Ruiz - With Phillies, Just signed to stay on through 2015. Pedro Feliz - Out of MLB appears to have last played with Camden Riversharks in 2012. Pat Burrell – Retired after winning another World Series with the 2010 San Francisco Giants. Currently scouting with the Giants. Shane Victorino – RF for the reigning World Series Champion Boston Red Sox. Selling his beard for charity. Cole Hamels – Phillies current Ace. Jamie Moyer – Retired in 2012 at age of 49. Brett Myers – pitched as reliever for Indians in 2013, Released on 8/29 and is currently a Free Agent. Joe Blanton – was 2-14 for the 2013 Angels. Kyle Kendrick – was in Phillies organization in 2013, but may be a free agent this winter. Chris Coste – Retired, last played MLB in 2009. Has done pre-/post- on Phils Broadcasts. Greg Dobbs – with the Marlins in 2013. Geoff Jenkins – Game 5 of the 2008 World Series was Jenkins last MLB game ever. Matt Stairs – Retired, last played MLB with 2011 Nats. So Taguchi – Returned to play in Japan, retired in 2012. Ryan Madson – Has not pitched in the Majors since left Philadelphia as FA in 2011. He is currently a FA was last seen in the Angels org. Clay Condrey - Last pitched in the Twins organization in 2010.